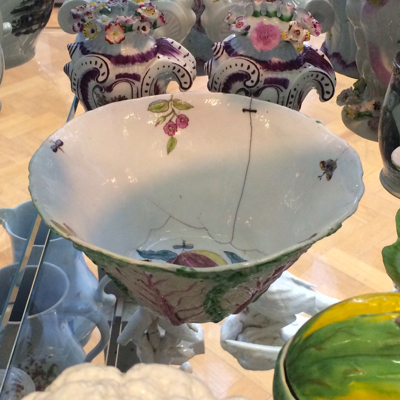 I am back in London for a brief visit on my way to Ireland and the very first thing I did upon arrival was to head over to see the magnificent ceramics collection at the Victoria & Albert Museum. 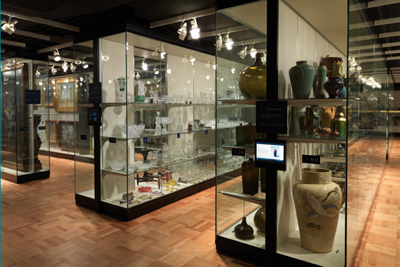 I could spend an entire day peering into the endless floor to ceiling glass cases filed with worldwide and world-class ceramics. 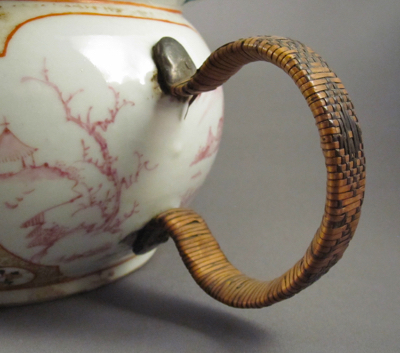 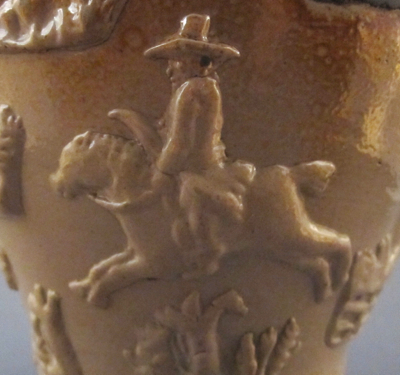 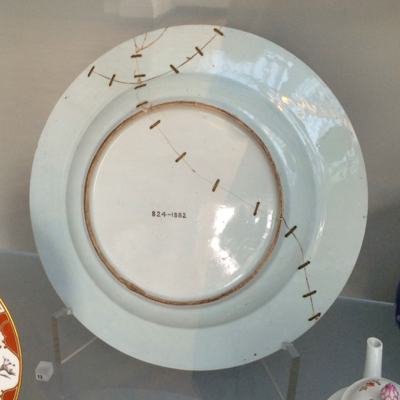 Here are some of my favorite examples of inventive repairs found among the collection. 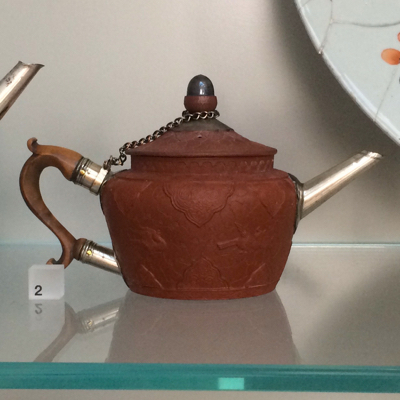 Take a look at this previous post from just over a year ago, showing other examples from the collection. 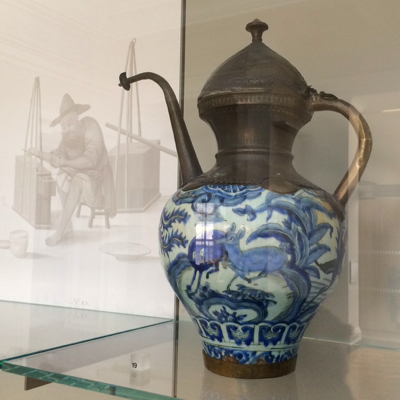 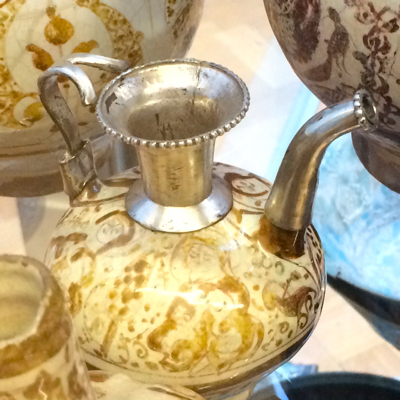 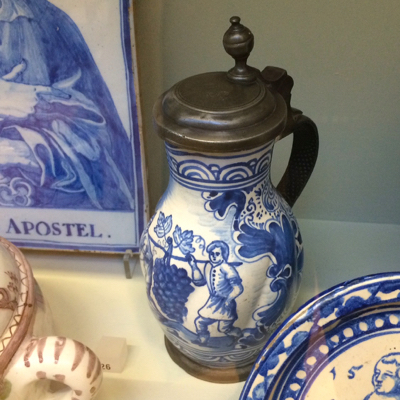 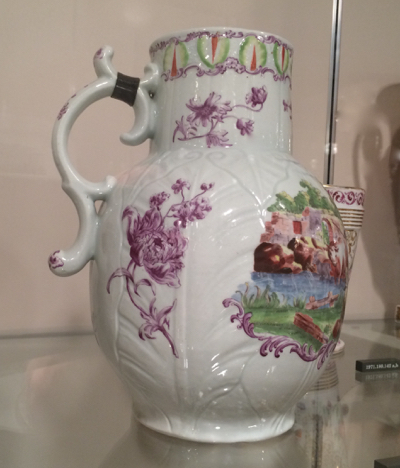 This heavy salt glazed stoneware ale jug was made in Mortlake, London, in the late 1700s to early 1800s. 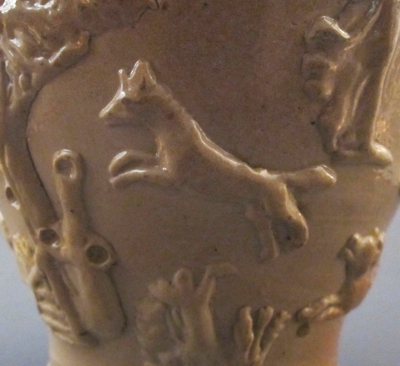 It has an attenuated baluster shape with applied sprigged decoration including a panel of “The Two Boors”, horses and hounds, classical figures, trees and a windmill on a mound. 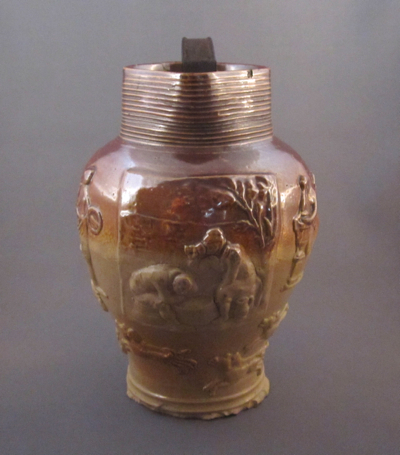 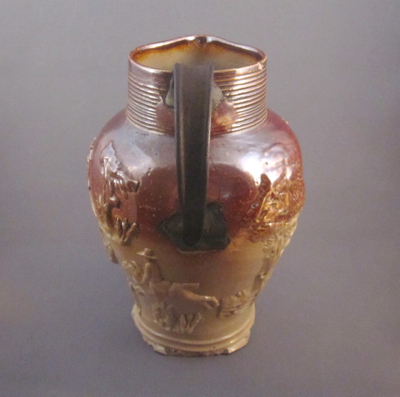 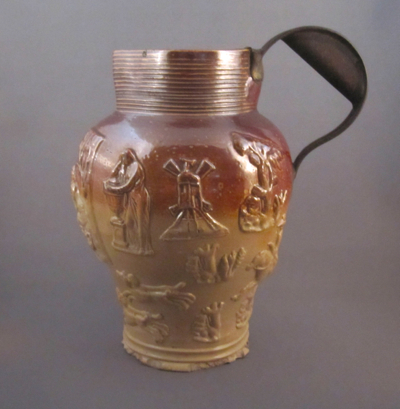 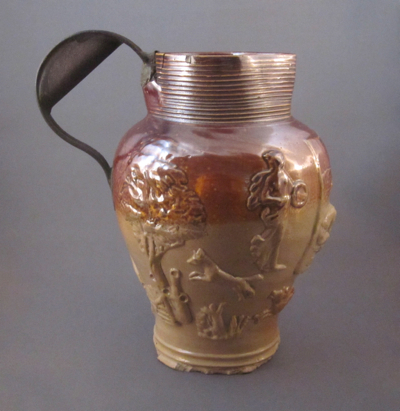 It stands 8″ high and has a rilled neck and a narrow base, much of which has been chipped away. 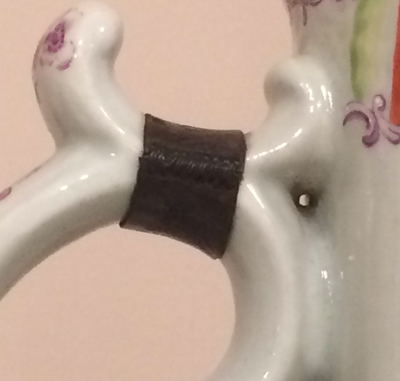 It’s apparent that the original handle is long gone but luckily for me, a tinsmith in the 1800s fashioned a wonderful metal replacement handle. 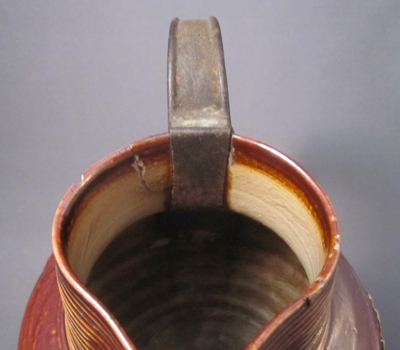 It has crimped edges for extra support and a finger rest for comfort when tightly gripped. 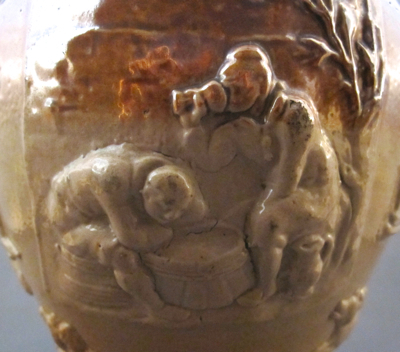 I imagine the original owner and a chum were inspired by the front panel depicting “The Two Boors”, drank too much ale and dropped the jug. 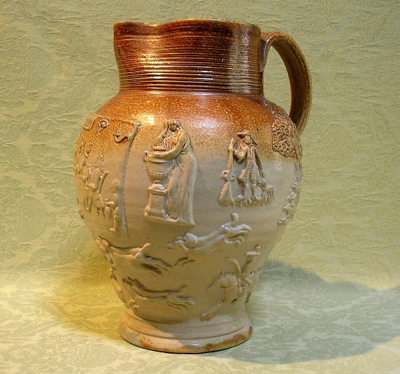 But if it weren’t for our ancestors who drank to excess, my collection of ale jugs with inventive repairs would be minimal to nonexistent. 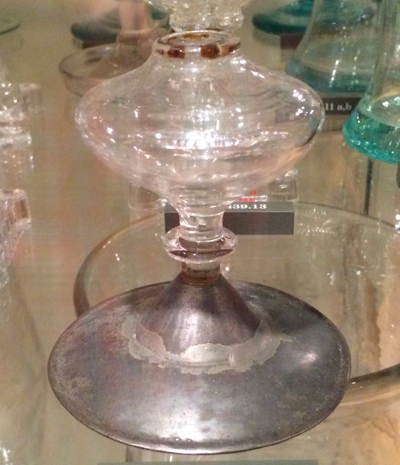 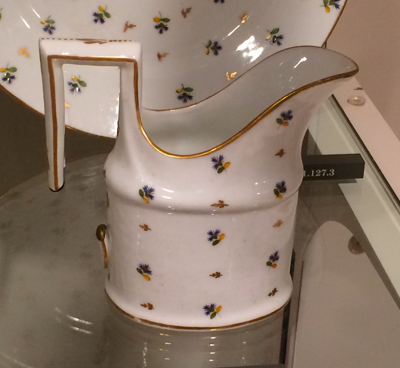 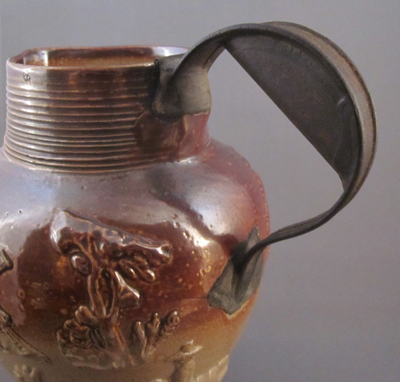 This jug of similar form has its original handle intact. 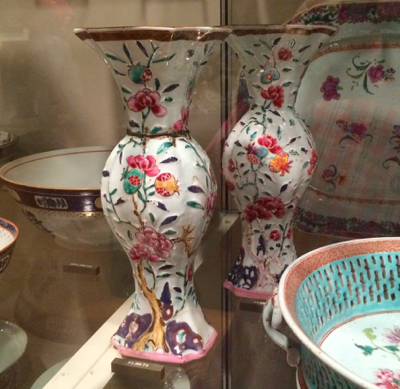 Earlier this week I took a stroll through one of my favorite spots in Manhattan, The Henry R. Luce Center for the Study of American Art at The Metropolitan Museum of Art. 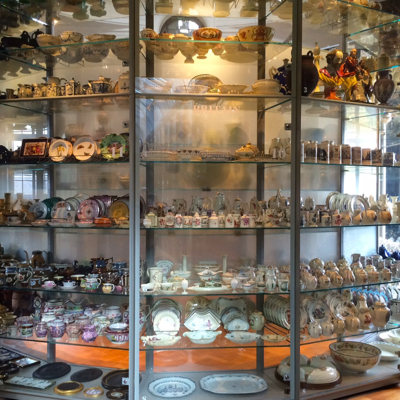 If the Smithsonian Museum is known as “The Nation’s Attic”, then I’d like to christen the Luce Center “The City’s Yard Sale” as it is packed from floor to ceiling with glass showcases filled with over 18,000 tchotchkes, including Tiffany lamps, Shaker boxes and Revere silver. 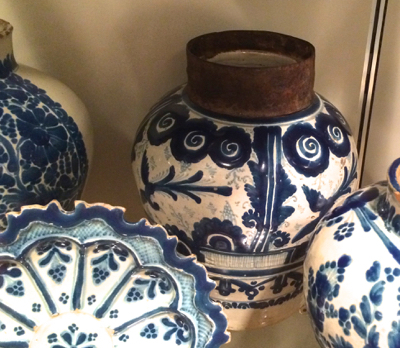 This impressive collection of the museum’s overflow allows the public to research and take a peek into the MET’s closets. 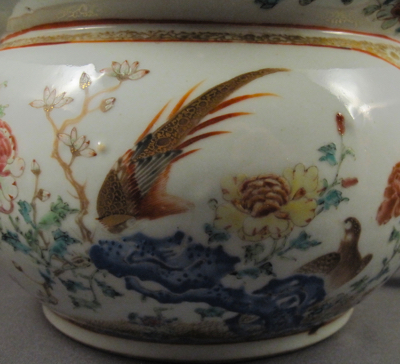 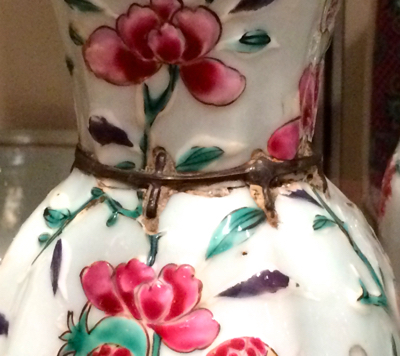 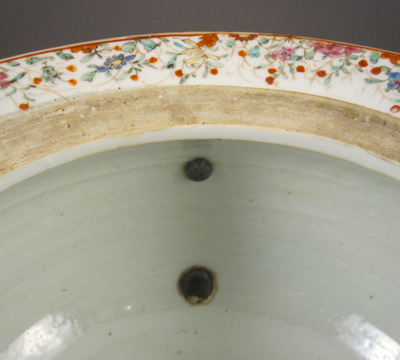 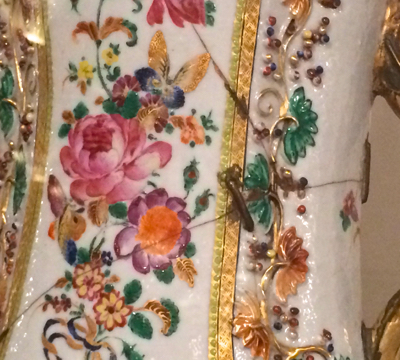 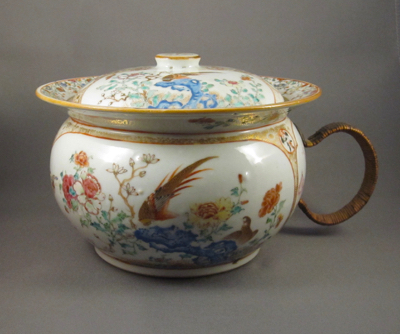 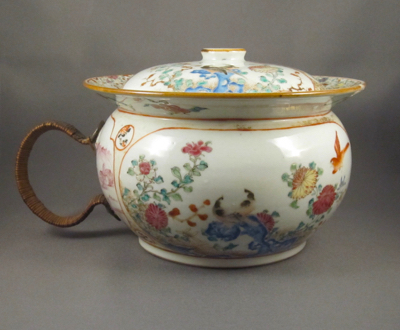 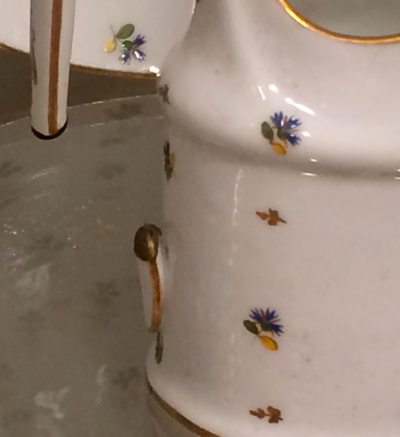 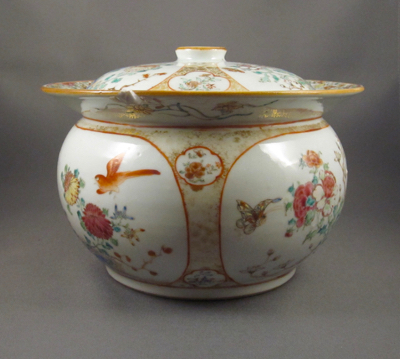 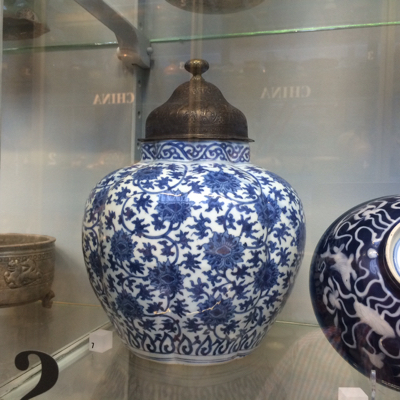 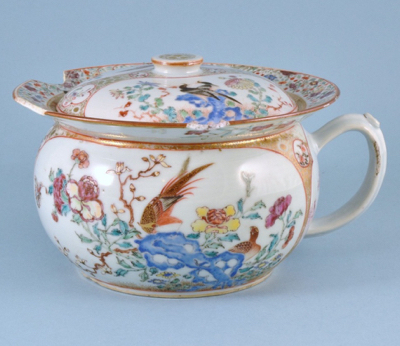 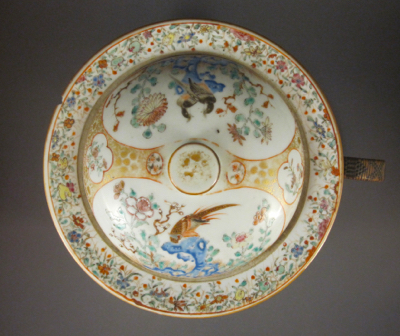 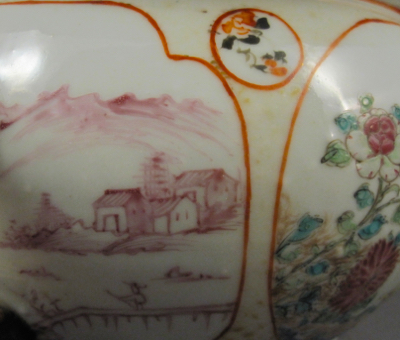 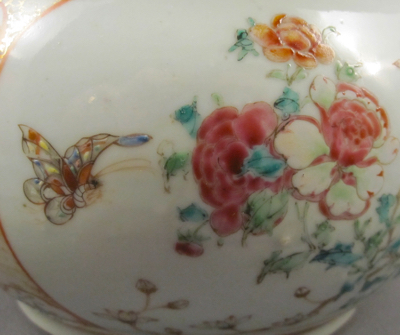 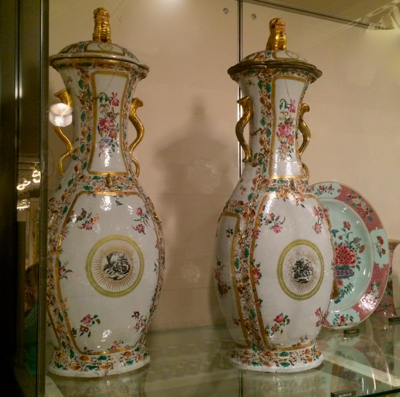 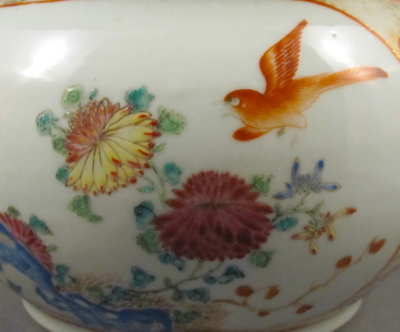 If you look closely among the rare Chinese porcelain and early English pottery you will find dozens of pieces in various states of disrepair including visible cracks, chips, worn paint and missing parts.